In general, industrial plants are equipped with “FAIL-SAFE SYSTEMS” to stop operations safely if and when unexpected malfunctions occur by shutting off the energy or fuel supply to the system or otherwise disengaging power mechanisms. In the case of nuclear power plants, however, it is impossible to turn-off the fuel supply as the system is like “an operating burner inside a fuel tank”. The only means to averting a “meltdown” is to suppress the nuclear chain reaction by inserting control rods into the reactor core and to gradually cool the fuel rods with constantly circulating water. This means that a nuclear power plant cooling system SHOULD NEVER BE STOPPED, which is why the cooling system is robustly designed to provide double, triple or more redundant backup. Unfortunately, the recent tsunami was much more forceful than anticipated by the plant operators, and all of the back-up systems were destroyed or incapacitated. After the nuclear chain reaction is controlled, it is critical that the damaged cooling system be repaired or replaced with a new system, which should be designed to operate reliably on the scale of ten years or more. Cooling the system by hosing it with water is a temporary and unsustainable short-term measure. Repair or installation of the cooling system will unavoidably be conducted in an environment highly contaminated with radioactive elements with serious risk of future health complications. As such, young people with a long future should not have to be placed in a position of having to undertake such a task. Radiation exposure of a generation which may reproduce the next generation should be avoided, regardless of the amount. Our generation who has, consciously or unconsciously, approved the construction of the Fukushima nuclear power plants and enjoyed the benefits of the vast supply of electricity generated, in particular those of us who hailed the slogan that “Nuclear Power is Safe” should be the first to join the Skilled Veteran Corps to install or repair the cooling system. This is the duty of our generation to the next generation and the one thereafter. Currently, many of the workers engaged at the nuclear power plants are being employed without consideration of age, knowledge, skill or experience. The Skilled Veterans Corps shall consist of volunteers of veteran technicians and engineers who are much more qualified to carry out the work with much better on-site judgment. Employed by Sumitomo Metal Industries, Co. Ltd. 1962 – 1989. Worked in the field of metallurgical engineering, plant engineering, environment engineering, etc. Institute for Energy and Environmental Research’s president Arjun Makhijani made the following proposal to the situation at the Fukushima Daiichi Nuclear Power Plant. • a lack of light in the turbine buildings, which has forced the electricians to work in the dark. A former nuclear power plant engineer Yuzo Uehara made additional proposals today. Proposal 2503102: After overcoming the current situation, I think that the preparation work for the permanent solution would begin within 3 months. 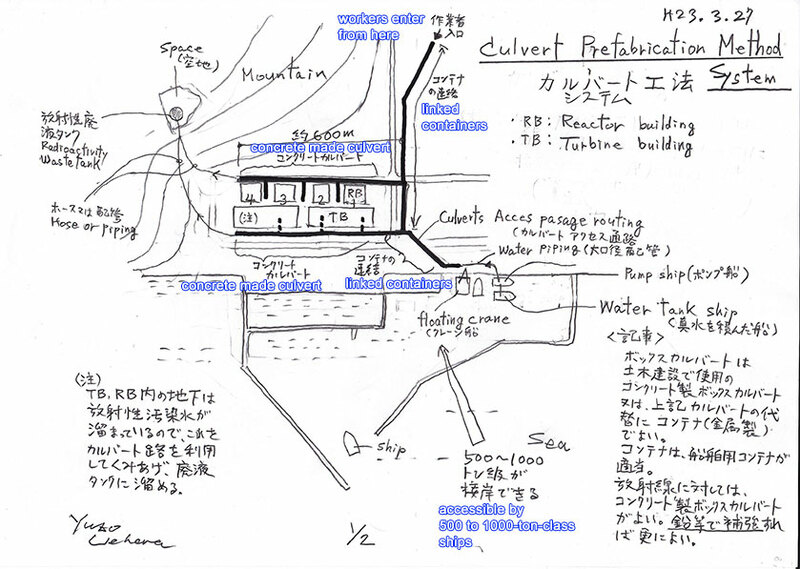 In order to get closer to the site and avoid radiation, whoever consider it, they have no choice but the culvert method. As a temporary solution for the current situation, first of all, using containers allows us to work under the safe condition. It would be a long long battle for all of us Japanese. 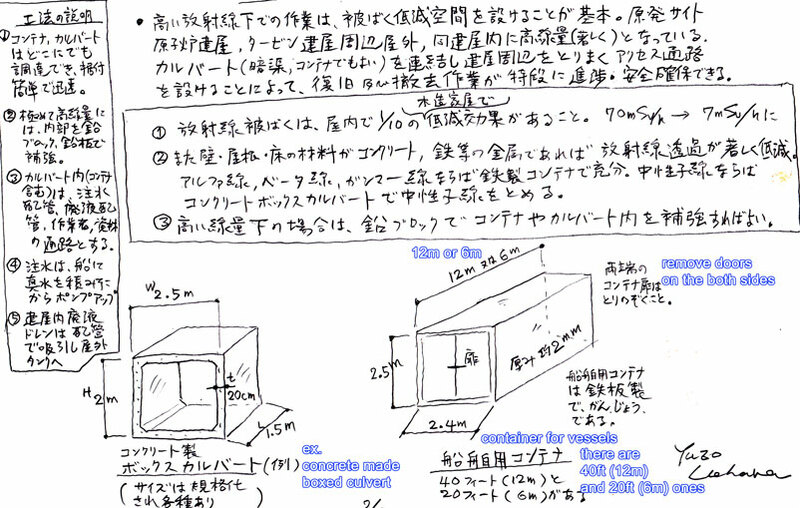 Solution for wide spreading radiation 2510304: When it rains, it soaks through the ground. Use storm sewers and such to treat sewage. Then send it to the sea. Where should we stop contamination? The issue is a massive scale. Build huge tunnels or pools underground, and dilute sewage, then discharge. That’s the only way. Building smaller cascaded underground pools is relatively easy. I would call it the underground pool cascading method. According to Yomiuri Online news today, the US Military is now cooperating with Japan and going to use a barge (or barges) to bring massive amount of fresh water near Fukushima Daiichi Nuclear Power Plant. This plan is very similar to what the ex-engineer has been proposing, he said on Twitter. 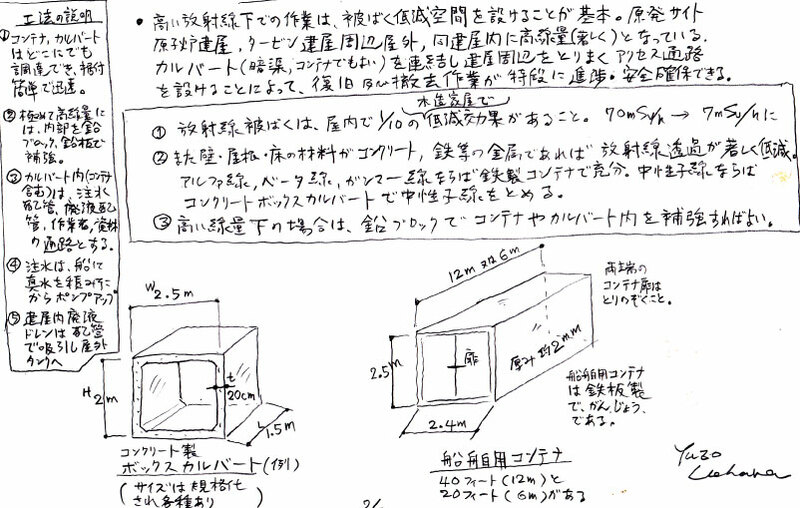 A former nuclear power plant engineer Yuzo Uehara posted the following tweets on March 24th. Proposal 240323: Radiation exposure decreases to 1/10 inside of a building for sure. A culvert (imagine a tunnel) made of metal containers or concrete would be good. Installing lead etc. on the walls would be more effective for reducing radiation. Not only inside of a culvert but also its back side has very good blocking effect. It’s better to install it at the nuclear power plant site. Proposal 2403242: TV report said that workers extending cables had radiation exposure. 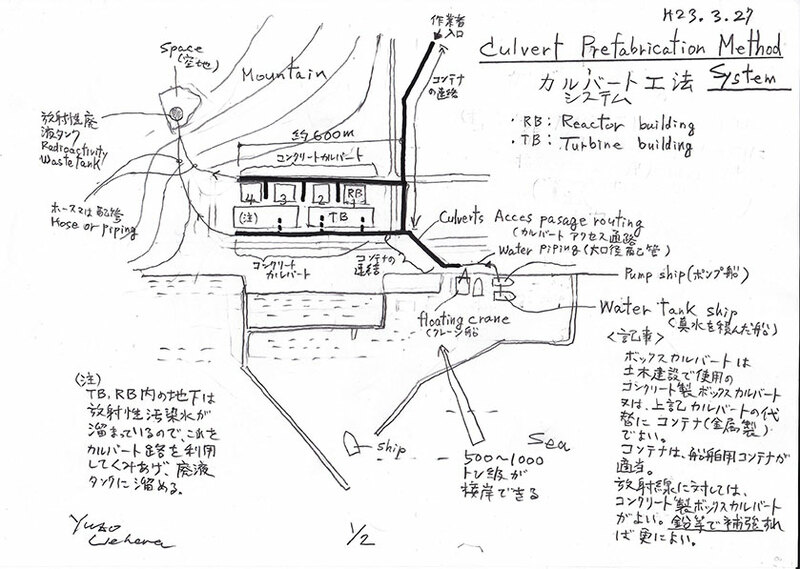 If the culvert method, I proposed, had been applied, I think it could have been prevented from happening. Because it’s an emergency situation, safety is fundamental. If a small and compact culvert were installed inside the buildings, it allows us to put workers and equipment in place appropriately, and makes shifting easy. Giving reassurance is a fundamental of safety. Proposal 2403244: During the work inside the high radiation buildings, radiation management is key. Install small and compact culverts every 10m and make them the accessing path as well as a equipment yard. Cure plastic sheets inside and install awnings with lead sheets outside. Inside the culvert, the air is sent through the pipeline to keep positive pressure. This is the radiation management during the work. Setup makes the work quicker.